Description: A look at drawing the structure of what lies beneath the face and head - the skull (frontal view). how can i download the module? i followed the directions, but the download button dos not respond to me. i will try from another computer, and let you know. can you tell me the measurements of each lines you made? approximately ?? When I tried I was unable to determine how large the circle should be, how far it came down on the line I had drawn, then how wide to make the lower portions of the skull. When I tried to guess, it was too narrow. Where can I get measurements? I think I have missed a tutorial on measurement when drawing from sight? Is this in the secrets to drawing course? I haven’t looked at that yet. 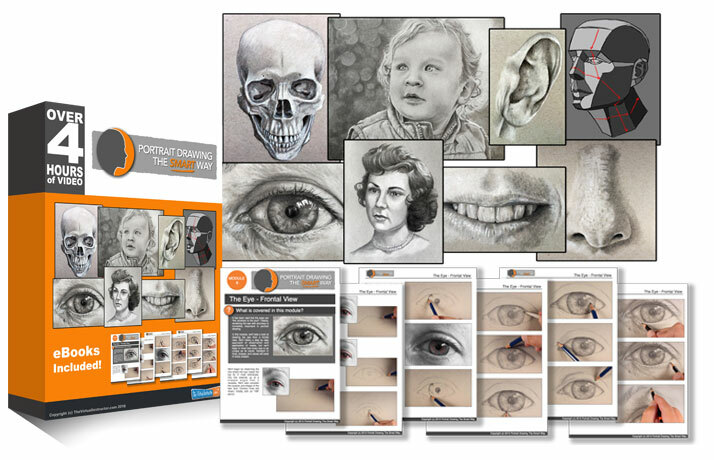 Basic facial proportions and measurements are in module 4 of this course. This is a great drawing which highlights all the deep fossa of the skull which might have been overlooked but which were so well demonstrated. Matt I can’t find a Toned Grey pad. The Charcoal pencil seems to need to be imported from China for some reason. I found a pastel pencil ( white). Will that do? and can I use white paper? You can use white paper, but keep looking for the gray paper – it makes a huge difference. You’ll need to be more specific with the issue that you’re having. Videos are downloaded by following the “Download Page” link which appears after the trial period is over. The video files are available for download – audio only files do not exist. Hey Matt, have you considered making a facebook group so we can see each other’s art work progress? It’s sounds as though you are experiencing some buffering which happens when your internet connection is unstable or a little slow. You can scroll over the video and click on the gear icon. Change the stream resolution to a lower resolution and it should fix the issue for you. Iv just started using this module. Like how Carolyn Blankenship mentioned earlier (on July 10, 2016 at 8:47 pm) , how do you determine how big the circle should go. I got the basice first vertical line to put in. But how would one know how larger the dia of the circle should be ? When looking directly at the skull, like we see in this module. The circle is approximately half the length of the line drawn in the first step. I hope this helps. Getting network error when trying to download video of skull. Do I understand correctly that none of the services are available for review during the trial period? If not, which of the services can I access as a new member who wants to evaluate the program during the seven-day trial period. I can understand why you prefer that no one downloads a video until he pays the full amount, but can he not even view a video during the trial? No, you can watch all of the videos and download the ebooks. The only feature that is disabled during the trial is downloading the actual video files. You can stream the videos and watch them by simply clicking on the play button on the video above.